Offshore wind power or offshore wind energy, a technology which uses wind farms installed on offshore sites to harvest wind energy to produce electricity, is one of the most promising green energy technology segments in the Asia Pacific region presently. The presence of a large number of high-potential offshore sites in the region, encouraging governments and regulations, and rising foreign investment are all helping drive the market at a significant pace. 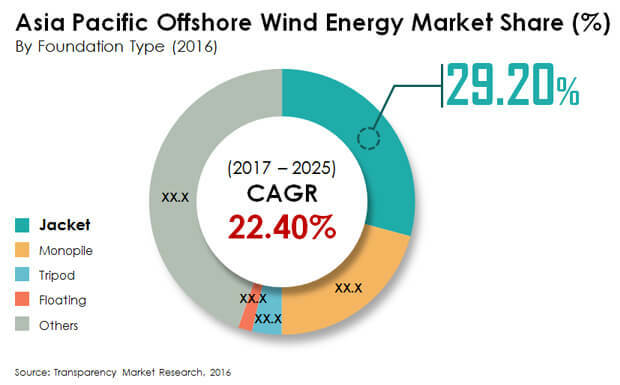 While the market is a relatively un-untouched aspect of wind energy generation in Asia Pacific, the region, often referred to as the next power and economy hub, is expected to emerge as one of the key investment locations for offshore wind energy in the near future. Transparency Market Research estimates that the Asia Pacific offshore wind power market will exhibit an exponential 22.4% CAGR from 2017 to 2025, rising from a valuation of US$8,960.8 mn in 2017 to US$60,201.5 mn by 2025. In terms of type of foundation, the Asia Pacific market for offshore wind energy is segmented in the report into monopole, floating, jacket, tripod, and others. Of these, the others segment, including foundation types such as high risk pile cap (HRPC) and ground mounted foundations, accounted for a massive 44.7% of the overall market in 2016. The segment is expected to continue its strong growth throughout the forecast period as well. Standing second in terms of share in the Asia Pacific offshore wind energy market, the jacket segment also accounted for a significant share in the market in 2016, while the floating type and tripod segments had limited presence. Tripod and floating segments accounted for minor share of the market as these type of foundations have limited presence due to financial and environmental factors. Market share of the jacket segment is expected to witness a notable drop during the forecast period while the floating type and tripod segments will continue to have minor share in the overall market. The monopile segment is also estimated to witness a decline in its market share during the forecast period. Monopile foundations are not suited for offshore wind installations in China and other countries like South Korea and Japan have few offshore wind projects lined up with monopile foundations. As a result, their share in the Asia Pacific offshore wind energy market is not projected to witness any rise over the report’s forecast period. Currently in Asia Pacific, China is the only country that has set aside separate targets in its green energy plans of the next few years for offshore wind energy projects. Japan, South Korea and India are expected to emerge as high-potential markets offshore wind energy generation. However, apart from China, other countries in Asia Pacific are yet to commission and/or start constructing utility-scale offshore wind energy projects. China is likely to drive the growth in capacity additions throughout the forecast period. Despite recently reducing its capacity addition targets, China has revised the target of approximately 10GW generation by 2020. China would thus require the addition of at least 1 GW of new offshore wind energy generation capacity annually, post 2016. Value chain, which includes turbine costs, foundation costs, cabling costs, and installation expenditures, may witness reduction in overall CAPEX during the forecast period. Overall, the maximum cost reductions are expected to be observed in China and India the governments in these countries have devised nodal agencies to monitor and encourage more of offshore wind turbine installations along with grid constructions to the nearest shores. The extent to which cost reductions and supply chain concentration are achieved within the forecast period would be a critical determinant of the expected annual capacity additions in the offshore wind energy sector. Some of the leading players operating in the Asia Pacific offshore wind energy market are Sinowel Wind Group Co., Ltd., China Ming Yang Wind Power Group Ltd., Siemens Wind Power, Gamesa Corporacion Technologica S.A., Nordex S.E, Vestas Wind Systems A/S, Dong Energy A/S, Suzlon Group, GE Wind Energy, and Goldwind Science Technology Co., Ltd.
Wind power generation is the extraction of kinetic energy from the wind and its conversion into any useful type of energy such as thermal, mechanical, or electric energy. This can be achieved through the use of: wind turbines to generate electricity, windmills for mechanical power, wind pumps for water-pumping or drainage, and sails to propel ships. Energy in the wind turns three, propeller-like blades around a rotor. The rotor is connected to the main shaft, which spins the generator to produce electricity. Large number of offshore wind energy projects are under planning and construction phase due to the fact that offshore wind farm installations has high advantages as compared to onshore wind farm installations. High land surface requirement, high noise generation, high cost incurred in project set up and the entire value chain (including turbine and its accessories cost, cabling cost, installation costs and others) of wind energy generation from assets based on land have led to shift of focus from onshore to offshore. Advantages of offshore wind energy installations includes overall reduction in project capital expenditure, unobstructed primary fuel required for energy generation from the offshore wind turbines, which is wind. Offshore wind energy projects are largely being financed by the government agencies which also includes big EPC players, manufacturers, distributors and service providers. With growing population and economy there is definite need for more electricity. Paucity of land resources have encouraged the local government agencies and global renewable energy control bodies to go for alternate arrangements which is offshore installation of wind turbines. Currently, China has largest number of offshore wind energy projects under planning and construction phase which is followed by Japan and South Korea. India has the maximum potential for installed capacities and the government of India has thus decided to have a Policy that will enable optimum exploitation of Offshore Wind energy in the best interest of the nation and to achieve the its interest to develop Offshore Wind Farms. China has outlined the policies and clear mandate to accelerate and promote the development of offshore wind energy projects. New Zealand, Republic of Korea, Thailand and Japan have respectively formed governing bodies to initiate, finance, execute and maintain the proposed offshore wind farm installations for energy generation. Primary research represented the bulk of research efforts, supplemented by extensive secondary research. We reviewed key players’ product literature, annual reports, press releases, and relevant documents for competitive analysis and market understanding. Secondary research includes a search of recent trade, technical writing, internet sources, statistical data from government websites and trade associations/agencies. This has proven to be the most reliable, effective, and successful approach for obtaining precise market data, capturing industry participants’ insights, and recognizing business opportunities. Secondary research sources which were typically referred to include but are not limited to: company websites, annual reports, financial reports, broker reports, investor presentations, SEC filings, internal and external proprietary databases as well as relevant patent and regulatory database, national government documents, statistical databases, market reports, news articles, press releases, industry magazines, webcasts specific to companies operating in the market, Platt’s Global, IEA (International Energy Agency), Lloyds Register, International modules for STCW (Standards of Training, Certification and Watch-keeping), ICS (International Chamber of Shipping), MARPOL (Marine Pollution), UNCTAD (United Nations Conference on Trade and Development), U.S. Energy Information Administration (EIA), BP Statistical Review of the World (2014), IACS (International Association of Classification Societies) and regulatory databases such as ICIS, Hoover’s, oneSOURCE, Factiva and Bloomberg, national government documents, statistical databases, market reports, news articles, press releases, Global Wind Energy Council (GWEC), European Wind Energy Association (EWEA) and webcasts specific to companies operating in the marine fuel management market. Key major companies operating in the offshore wind energy market include and are not limited to Sinowel Wind Group Co., Ltd., Siemens Wind Power, Dong Energy A/S, Gamesa Corporacion Technologica S.A., Nordex S.E, Vestas Wind Systems A/S, Suzlon Group, China Ming Yang Wind Power Group Ltd., GE Wind Energy, and Goldwind Science Technology Co., Ltd.